A friend of mine and I often reflect on the days when OS X first came out. No more fiddling with extensions. Everything worked solidly. And the interface and user experience was awesome. We all loved our Apple computers. Well those good ol’ days are gone. I came across this video last night and I just have to share it because the guy shares all of my frustration about Apple. I can only assume everyone at Apple is using PCs because there’s no way they can actually enjoy using the junk they’re designing these days. • They no longer support creative professionals which was a large part of their base in the past. It seems like everything they do serves their mobile platforms. • Their design process appears to be entirely arbitrary, removing features that everyone likes and implementing useless features that only serve to complicate usage. • They intentionally break older devices in order to force users to upgrade. Does anyone remember the little Airport that allowed you to play music on your stereo from any Apple device? Apple updated iTunes so that the Airport became a useless brick, trying to force users to buy the Apple TV. • Apple monopolizes app purchasing and I’m convinced their iTunes updates serve only one purpose: to screw up people’s jailbroken devices so that they can’t purchase apps elsewhere. • They intentionally remove optical drives and certain types of ports to force users to purchase adapters or to force them into the cloud. Now, imagine you work at Apple and you’ve designed a product that works really well and the user interface experience is great. Now what do you do for the rest of your time? Either you keep improving the product or you lose your job because you’re no longer necessary. Well, if the product is already well-designed, the only changes you can make are likely to make it worse, not better. But not wanting to lose your job, you justify your existence by redesigning things. This of course angers everyone because, unless you’re improving things by making the computer do something entirely new, like shining your shoes or making you breakfast, you’re just complicating the user interface either in terms of usability or aesthetically (I’m so sick of industries telling consumers what is “hip” and what is “outdated”, as if our tastes must be dictated to us and we must fall into line. Mock me if you will, but I liked the Coverflow feature in iTunes and I’d like it back). Anyway, Apple’s arbitrary design changes have led me to stop updating my Apple devices. I’m now several operating systems behind on both my iMac and my iPad. I definitely NEVER update iTunes for fear they’ll break something or remove a feature that I like. And not being a cell-phone user until recently (out of necessity), I was determined not to get an iPhone. About the only Apple product I’m excited about is the new 12″ iPad, and that’s only because Procreate is a great, affordable program. But the worst thing of all, if my iMac breaks, it will be difficult to migrate to a PC because I’m so heavily invested in software made for Apple. I just can’t afford to purchase all of my professional software all over again. So I feel like I’m stuck. Thanks, Apple. You got me. Here’s a detail from Ayars Animation’s Cozmo app. Every time I open the app and go to this page, I remember how much work it involved; not just because of the illustrating, but because it had to be done in, like, a bazillion layers in order to facilitate the animating and interactive elements (and if you’ve tinkered with the app, you’d have an idea of what I mean). 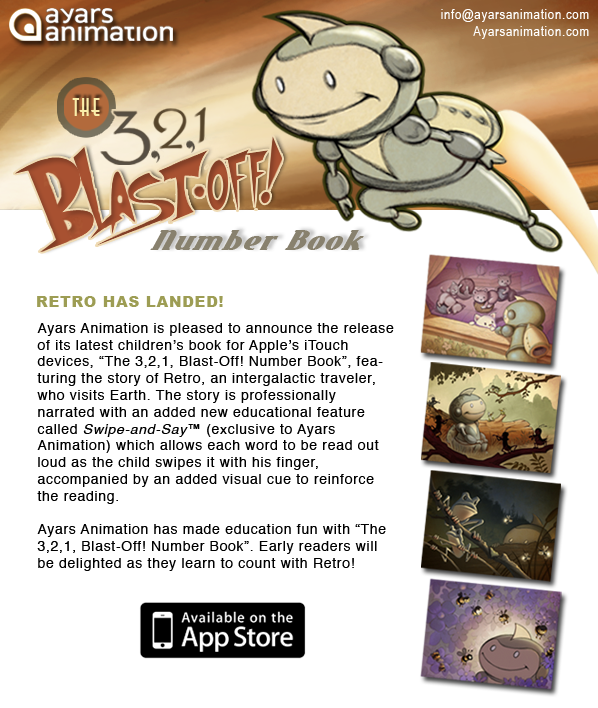 Our latest children’s book has been released (find it HERE). It’s a number book for pre-schoolers, and Trinity, my eleven year old daughter, helped me write it. 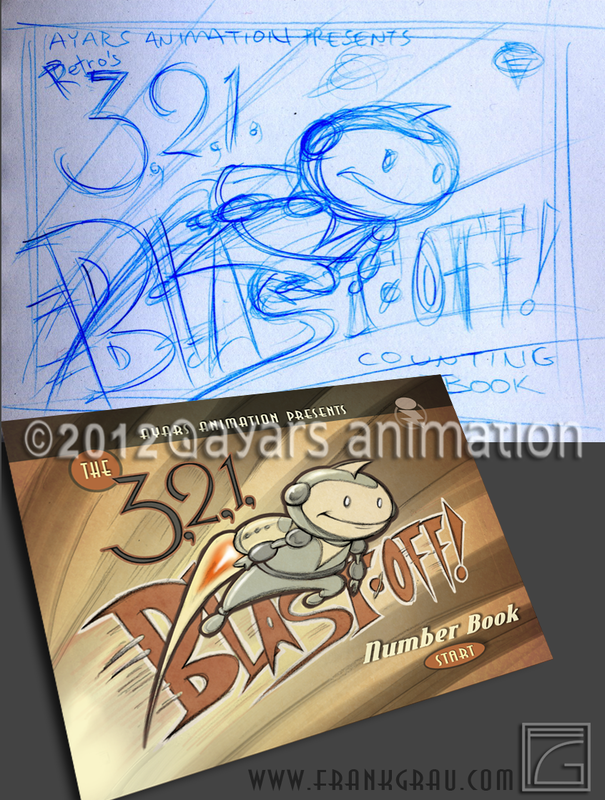 I illustrated this particular app at breakneck speed. Here’s the flyer for it. 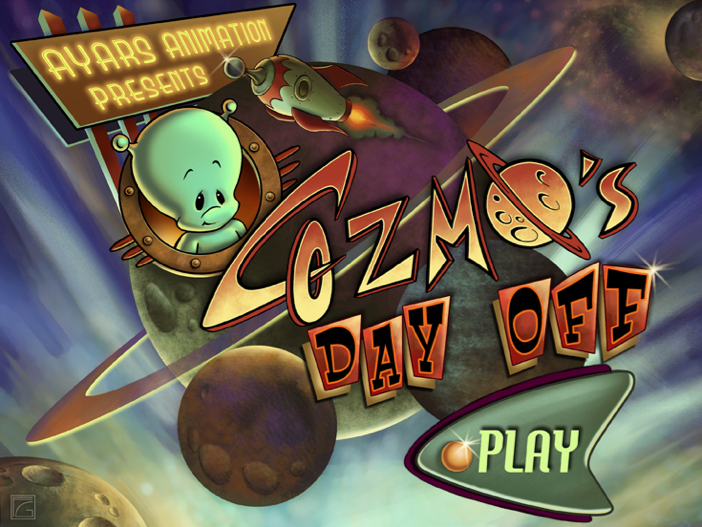 As I already noted in a previous post, I created a lot of characters for the Cozmo’s Day Off iOS app. 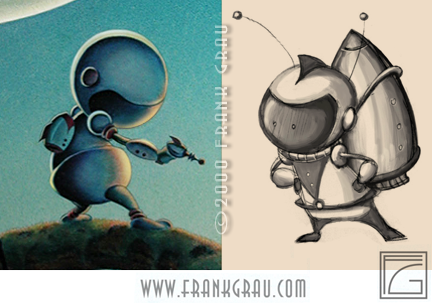 Whimsical robots are always fun to design, and this was one of my favorites. 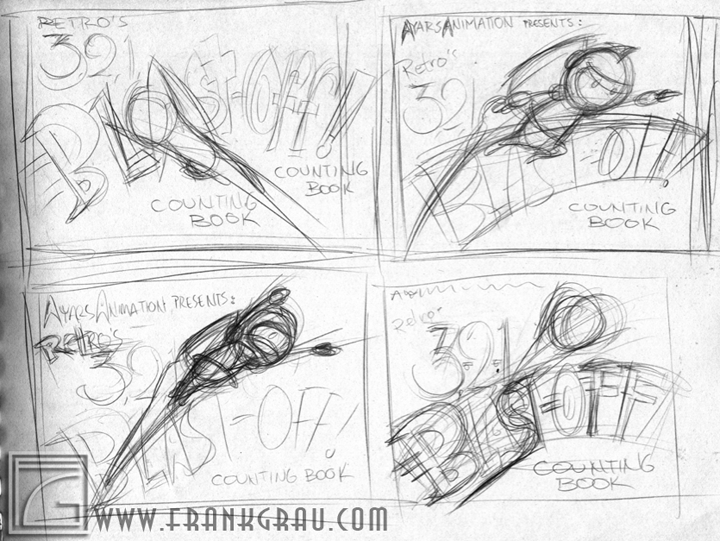 Like some of the others, this character only makes a brief appearance, this time on page 8. What you have here is a robot dashing across the screen to get his coffee order. When he crosses back again, he’s relaxed as he carries his java fix in his grip. That’s right – even robots like a cup ‘o’ joe on occasion. Don’t you? 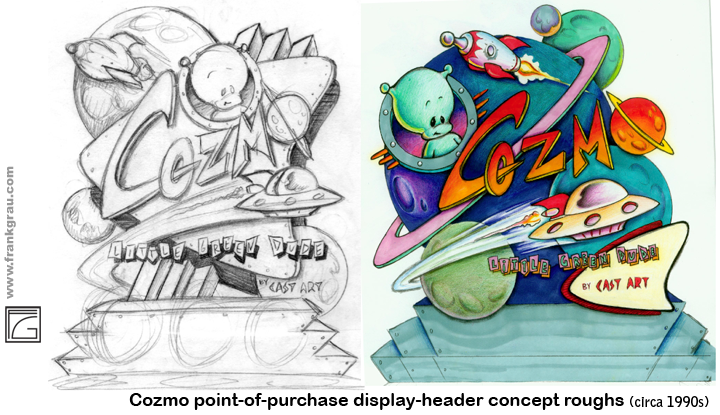 I originally created Cozmo back in the 90’s as a figurine line while working at Cast Art Industries (figurines made up a large percentage of the giftware industry at the time). Besides illustrating and designing giftware, I had various other art-related chores I would be called on to perform, from helping design sets for our catalog photo shoots, to creating a birthday card for the owner’s best friend (when you own your own company, you can get your employees to do just about anything as long as they’re on the clock). 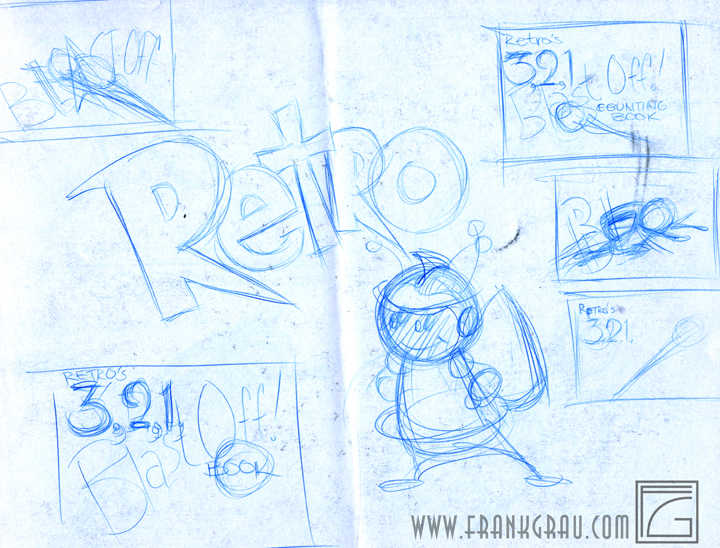 One of the things I was sometimes asked to design were point-of-purchase (or POP) display headers for our products. A figurine POP was usually plastic or cardboard, with stepped rows, and usually had an illustrated header which served as a backdrop to help stage the figurines. When I designed the Cozmo figurines, I also created some rough POP header concepts. 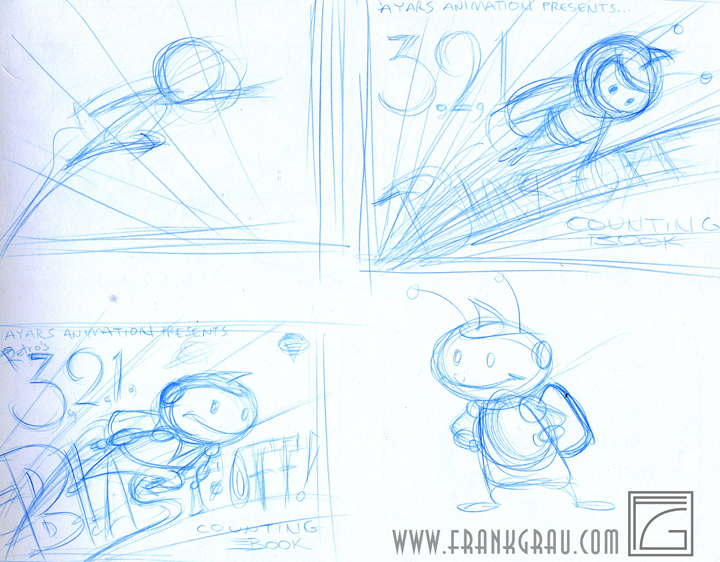 Fast-forward to 2010 at Ayars Animation, where Frank Ayars and I are discussing what we might do for a second iOS app. I had plenty of intellectual property ideas, one of which was Cozmo, so I pitched that to him. He gave it the green light, and off we went. So there I was about to design a menu page for the app. I really liked certain elements about the earlier Cozmo POP concepts I did for Cast Art, so I looked to them for inspiration, and they formed the basis of what eventually became the final menu page design of the app. All of that to say, if you have a good idea that you’re not putting to use, don’t let it go to waste. If the need or opportunity presents itself, don’t be afraid to reach back in the past for something that can serve you well in the present.